SharePoint Reporting software SharePoint Farm Reporter’s new version is bundled with four new reports (includes 3 site audit reports) and a couple of report enhancements. 1) SharePoint Reports – Audit Custom Events: This report displays information about the custom events that occurred in the list items including changes in workflow settings during the recent ‘N’ days or for the given date range. Report fields: Web URL, Web Title, List Name, Item URL, Item Type, Item Name, Event Name, Event Data, Occurred, Performed By, Performed By ID. 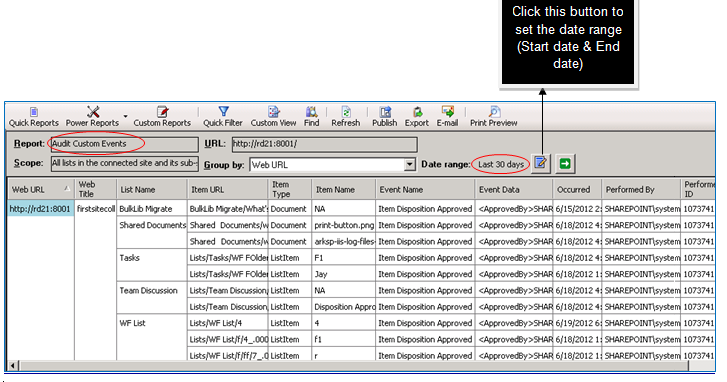 2) Audit Log Trimming: Shows the audit events that were deleted from the SharePoint Database in the recent ‘N’ days or the given date range. 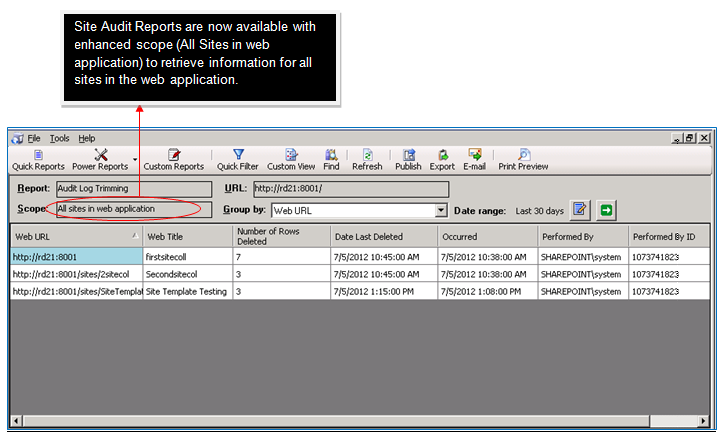 Report fields: Web URL, Web Title, Number of Rows Deleted, Date Last Deleted, Occurred, Performed By, and Performed By ID. 3) Audit Settings Changes: View the audit settings that were changed in the site collection in the recent ‘N’ days or for the given date range with this report. Report fields: Web URL, Web Title, Old Settings, New Settings, Occurred, Performed By, Performed By ID. 4) Site Templates: This report displays information about all the site templates available in the site collection. Report fields: Web URL, Web Title, Category, Template Title, Description, Template Name, ID. 5) SharePoint Change Reports – Audit Permission Level Changes: The inherited permission levels that were broken in the SharePoint site in each site during the recent ‘N’ days or for the given date range can be audited using this modified report. Report fields: Web URL, Web Title, Event, Audit Location, Permission Level ID, Permission Level, Old Base Permissions, New Base Permissions, Occurred, Performed By. 6) List Workflow Status: The following six reports of the earlier version (v2.0) are now merged into a single ‘List Workflow Status’ report with a ‘Workflow Status’ column indicating the task status accordingly – ‘Cancelled, ‘In progress’, ‘Completed’, ‘Not Started’, ‘Failed’, and ‘Error Occurred’ for each list item in the list. Report fields: Web URL, Web Title, Base Template, List Name, Item URL, Item Name, Workflow Status, Workflow Name, Initiator, Started On, Last Run, Task Title, Task Assigned To, Due Date, Task Status, Outcome.